This was a project out of sheer boredom and a spare new car alarm system my friend had sitting in his closet. I kind of wanted an alarm for my bike for a while, but I didn't like the prices of some of them. This alarm brand new was around $70. My biggest issue was where to mount the full sized siren, it just so happens that it fits perfectly under the seat to help keep it away from the road debris and out of sight. I managed to install the whole system under the seat in the back tail section to keep it neat. Another issue I ran into was the light warning output. Since this is a Car Alarm it was designed to be integrated into the parking lights, not so fortunate on a bike. I came up with a way to flash both left and right turn signals to compensate for that using the one output of the alarm and two relays (basic diagram below). This is a very loud siren and I'm happy with the end results... I have a few pictures and a demo video below, if you guys care for a more in-depth DIY let me know and I'll make a full step by step write-up. someone could just come and look at it and and rip the wires off even before they move it. unless you set it to super sensible. I have also done the same thing you did. 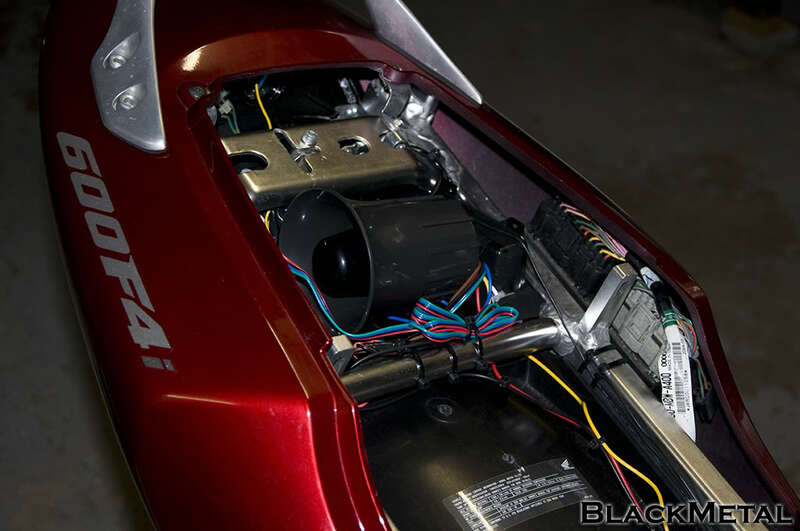 I installed a vehicle security system with remote start on my 2001 F4i using an Ungo SR6000. When I did my install, I mounted the siren next to the factory horn location so I had more trunk space. Not like there is a lot to begin with. No need to use up valuable trunk space for a siren. Also, you do not need to wire two relays for the flashing parking light feature. You just need to simply add a 1amp diode to each parking light wire. 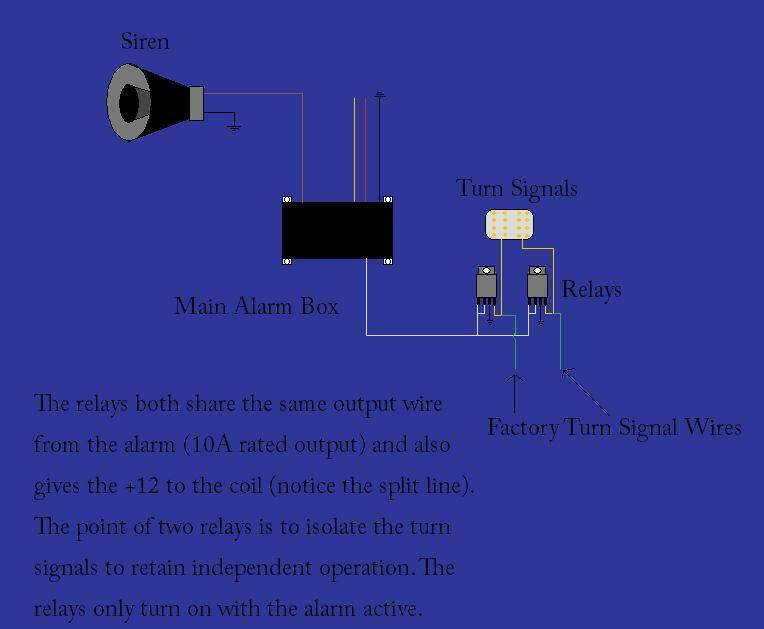 So, the Parking Light Wire coming from your alarm system would "Y" off into two wires. Each wire will have a diode inline that connect to the left and right rear turn signal wire. If you do decide to re-wire the parking light feature, you can always use one of the relays and add Starter Disable. By adding this it will prevent someone from starting your bike when the alarm is armed and the bike would only start when the system is disarmed. Also, you can always cut your excess wires and solder them so they are shorter so you don't have bundles of wire just sitting there taking up space. For me to wire up the security system with remote start and trunk release took a total of five hours.